1) The famous Creedmoor Match of 1874 between the American and Irish national teams came about as the result of a letter that was sent to the New York Herald and published on November 22, 1873 entitled “Challenge to the Riflemen of America from the Riflemen of Ireland”. 2) The two teams that competed consisted of six (6) shooters on each team. 3) The U.S. team used a combination of breech loading Remington Rolling Blocks and Sharps rifles. The Irish team used Rigby muzzle loading rifles. 5) The first Creedmoor Match was won by the American team on the very last shot of the match. The score with one shot remaining was the Irish team 931 and the American team 930. John Bodine, also known to many as “Old Reliable”, was a 48-year old former Colonel in the New York Militia. 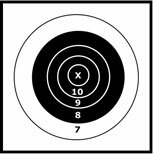 When his time came to shoot, he calmly walked to the firing line at 1,000 yards, got into his shooting position (which oddly enough was a face-downward posture, but not using any type of crossed sticks for support of the barrel), took aim, and fired. His shot struck the black bullseye of the target for a score of 4 — giving the American team the victory with a final score of 934. 6) One of the best shots on the Irish team, a 24-year old wool merchant by the name of J. K. Milner, scored a bullseye (4) on his first shot at 900 yards — only to discover that he had fired on the wrong target. His shot was scored a “Miss”. That miss probably cost the Irish team the match. 7) On the day of the match, September 26, 1874, the two teams shot the 800 and 900 yard relays in the morning, took a one-hour break for lunch, and then completed the match with the 1,000 yard relay in the afternoon. Apparently, one of the members of the American team, General T. S. Dakin, had a bit too much champagne with his lunch and did very poorly at 1,000 yards. He had three (3) misses out fifteen shots at 1,000 yards. His poor performance almost cost the U.S. team the match. Fortunately, another member of the American team, H. Fulton, a 29-year old surveyor, put on an outstanding performance to help make up for Dakin’s indiscretion. Fulton scored 36 bullseyes and 9 centres in his 45 record shots — with not a single miss. His final score, out of a possible 180 points, was 171!